The year is 1998. An extravagant restaurant opens up in the lesser-known neighbourhood of New Friends Colony to huge applause. Little did they know that 15 years down the line, not only would they still be in business but also ready to take the centrestage by opening a branch in the heart of Delhi! Pebble Street is your quintessential pub named after the famous cobbled streets of Britain back in the 19th century. Famous for its drinks, this place has also carved out a niche for itself in the arena of culinary delights. Serving cuisines from Indian to Mediterranean, Italian to Continental, Pebble Street also serves amazing finger food to go with your appetite for booze. We went on a journey of finding what to drink here and what best to team it up with! 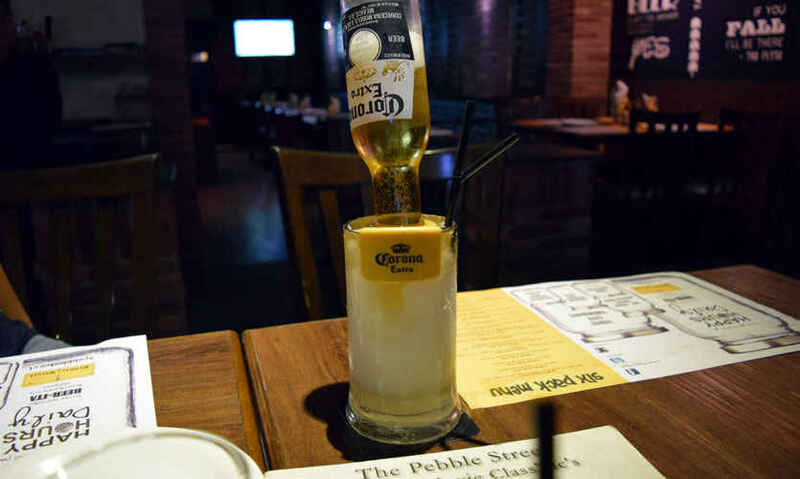 A special concoction whipped up by the bartender, it’s a mix of lime Margarita and a pint of Corona dangling upside down. 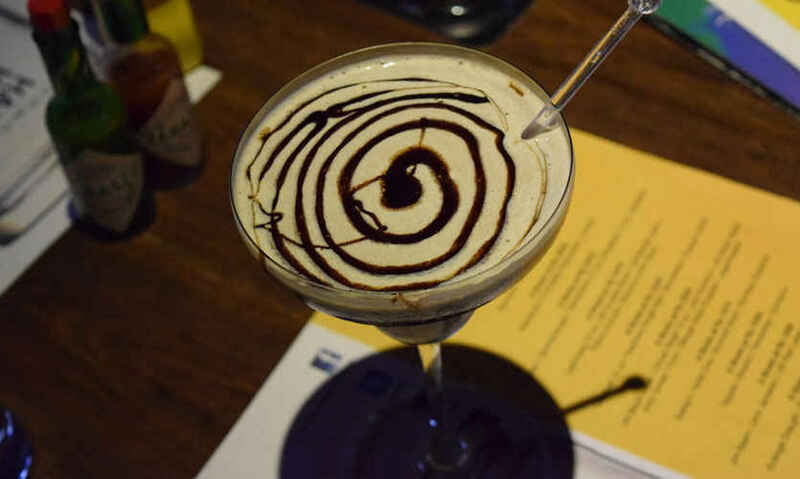 Along with the presentation, the drink is smooth and sure to get you up and high by the time you reach the bottom. One sip and this drink will let you loose for the entire weekend! If you are a diehard chocolate lover and also an ardent alcoholic, then this is custom made for you! Their Death by Chocolate contains splashes of vodka, kahlua, Bailey’s Irish Cream, chocolate syrup and is topped with chocolate ice cream. Do we need to say anything more to get you headed over to Pebble Street? We thought so! If we loved the cocktails, we sure adored the food too! This preparation of chicken comes loaded with some authentic Asian flavours. If you love lemon grass in your food, then this is a sure thing to pair up with your endless boozing. This dish is one of the best Asian delicacies on offer here, so definitely a must-try! This platter is as huge as it gets! 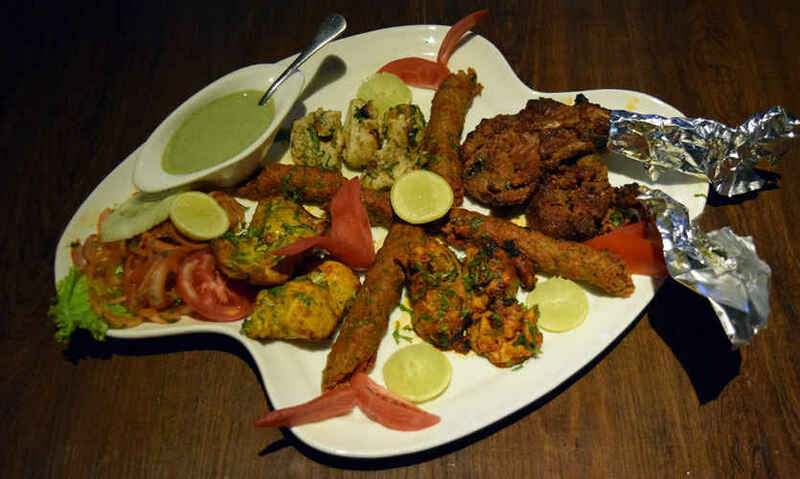 Serving 2-3 people, the platter consists of Chicken Malai Tikka, Fish Tikka, Mutton Kebabs and Mutton Burrah. It's one of the most perfectly cooked platters we have ever tried. 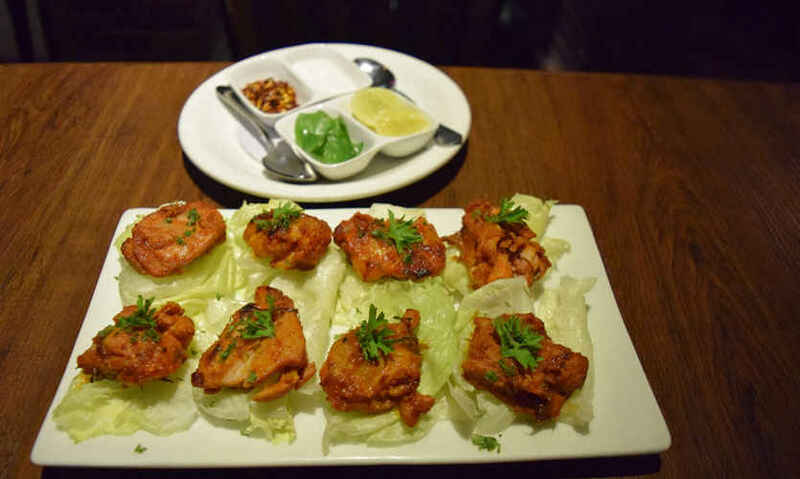 The Burrah, with its spicy tandoori flavor deserves a special mention as the most outstanding dish! One of the most sought after dishes eaten with alcohol is pizza, and Pebble Street downright nails this simple cheese pizza! Made with olive oil, oregano and four types of cheese, this is the one dish you need to order every time you head here. 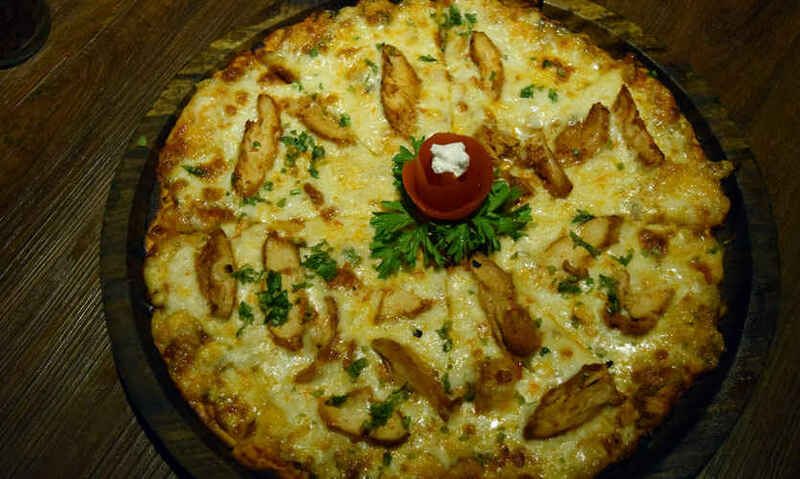 Although we couldn’t resist adding peri peri chicken as a topping, the outcome was as lip-smacking as ever! If you have an insatiable sweet tooth and need to eat dessert after every meal, then Pebble Street indeed gives you a reason to cheer! 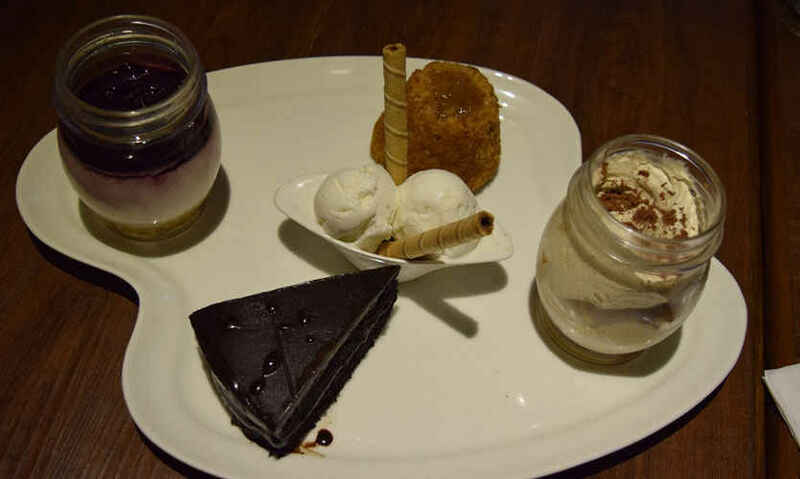 Their Dessert Sampler is surely the ultimate thing you will be laying your eyes on. They serve a huge jar of Tiramisu, Blueberry Crème Pie, Apple Cinnamon Cake and a Chocolate Fudge Cake served alongside vanilla ice cream. Pure bliss! This drink, as the name suggests, is for those who have Mumbai firmly lodged in their hearts. With Kala Khatta as the secret ingredient, tequila, vodka, white rum, gin, triple sec and lime juice are added. Their Mumbai Iced Tea is the perfect way to indulge in your alcoholic pleasures with a twist! Vegetarians don’t fret - the testiment to a good vegetarian time is here! We tried the cottage-cheese filled Pita Bites and were totally bowled over by the freshness of it. The pita was warm and fluffy and the filling of cottage cheese tasted just oh so yummy with garlic mayo. This is just the right order for our vegetarian readers out on the town for a drink! Pebble street also serves some amazing sheeshas along with almost all-day happy hours from 12:30 - 8:30 PM and even post the happy hours have great discounts on booze. So what are you waiting for? Get your buddies and head over here for an absolutely fantastic time. Oh, did we forget to mention that they have a huge screen for telecasting your favourite sports’ matches? Yup!